Ofcom, the UK's media regulator, has published a fascinating research report on UK children's use of media and digital devices (PDF here). It's long and covers a wide range of topics, from TV consumption and awareness of advertising to use of games consoles (which is falling), but there are a couple of data sets around mobile devices that I want to pull out. First, ownership and access. 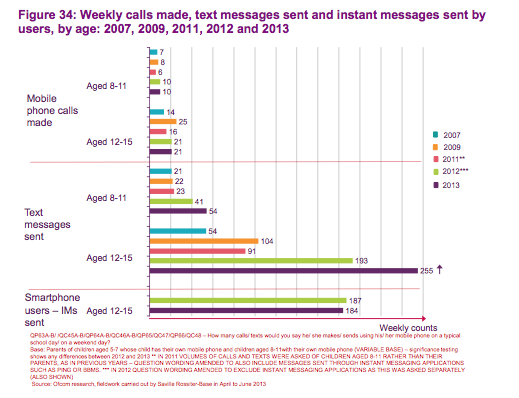 Over 70% of 15 year olds have a smartphone, and over half of 13 year olds (the notional cut-off for social networks). Use of devices other than TVs to watch television programmes is growing strongly. Dedicated games devices are in decline. And smartphones and tablets clearly on the way to replace them, but perhaps not as fast as one might think. But SMS remains the dominant form. Finally, entirely unsurprisingly, boys like computer games and girls like talking. Interesting how girls appear to outgrow games, though - and boys don't.